A Census of the Indian and French Inhabitants of Port Royal, Cap Sable, La Hêve, Les Mines, Mousecoudabouet, Cap Breton, Chiquenietou, Pintagouet, Canibeky, Port Rasoirs and the St. John River; translated and edited by Winston De Ville. 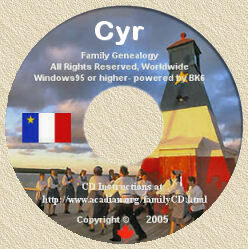 Enumerated are families of Babin, Bertrand, Boutin, Gaudet, Guidry, Melançon, Petit/Petitpas, Picou, Pitre, Robert, St. Aubin, Thibodeau(x), Vigé and Vincent among other well-known names of Acadia. An important, but generally overlooked aspect of Acadian genealogy is marriage between European settlers and Indians. 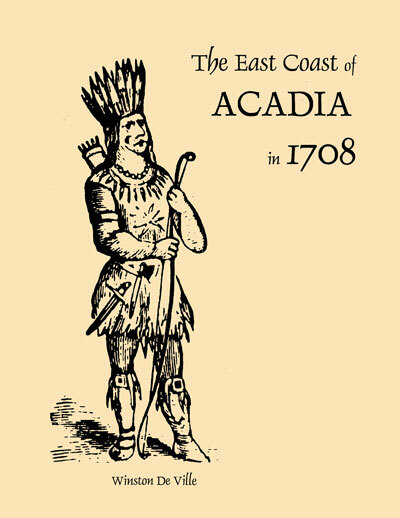 Throughout the colonial period, there are examples of Acadians taking brides from the Abenaki and MicMac nations. A new and rich field for genealogists is tracing Acadian ancestry into medieval times. The ground-breaking introductions addresses Acadian descendants from seventeenth-century European aristocracy even from Emperor Charlemagne. Notes provide sources for additional research on the intriguing subject. Ordering Information: Ordering Information: First edition; 60 pages; Index; 8 1/2" x 11"; Wrappers; Item No. A5; $28.50 USA. (See below). An Ecclesiastical Census of Port Royal, Les Mines, Rivières des Gaspards, Rivière de Pigiguit, Rivière des Habitants, Rivière des Canards, Rivière de la Vielle Habitation, Beaulieu, Cobeguit and Beaubassin. Winston's version of the 1714 Acadian census comes from both an expected source and an unusual source; the original and a copy of the original. This is due to what researchers had to use prior to microfilm and photocopy machines. The 1714 census itself gives a key to understanding the rift that grew steadily between the Acadians and their British 'masters', enabled by the 1713 Treaty of Utrecht. A French Recollect, Père Felix Pain and not the British government undertook this census. Father Pain did so at the request of the governor of Ile Royale and when he wrote to the governor in 1713, he explained that one-fourth of the Acadian population was elderly, and that moving large families into a new area devoid of housing and cleared fields, was tantamount to mass suicide! IN CANADA: Cost of book - $27.50 (U.S.); P&H: $12.50 for the first book; $4.00 for each additional book. Total for 1 copy: $38.85, Customer is responsible for any other charges. IN THE U.S.: Cost of book: $27.50 P&H: $2.50 for the first book; $0.50 for each additional book. Note: Louisiana residents are obliged to add four percent sales tax. Residents of East Baton Rouge Parish are obliged to add an additional five percent sales tax. In the United States, add $2.00 USA economy shipping, or $5.50 for Priority Mail. Orders from Canada, add $12.50 USA Priority Mail, or $7.50 USA for economy postage. Purchase-orders from libraries and other tax-exempt institutions are honored. Provincial Press, the publisher, accepts credit cards only on their web site catalogues with the use of PayPal at http://www.claitlors.com. Allow 2-3 weeks (3-4 weeks to Canada) for delivery by economy mail. The author of the excellent publication "The History of the Cajuns", my good friend Alex Loya, was deployed to Iraq and in his absence, I have been asked to act as official distributor of his book. The cost of this exhaustive 2nd Edition 678 pages book, is $39.95 (USA funds) plus shipping-handling. Merely connect to my secure server to place your Online Order using Visa or Master Card and allow 2-4 weeks for shipment (depending on inventory). Yvon Cyr.